Pulinkari means a curry with tamarind. 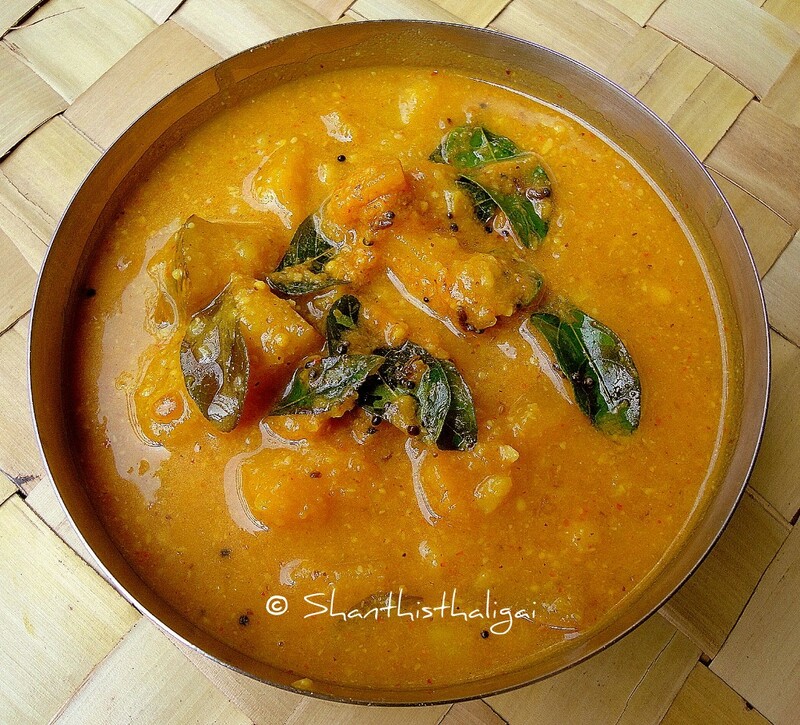 Mathanga Pulinkari is a Kerala style curry in which diced pumpkin is cooked in tamarind sauce alongwith some ground spices. The temperings in coconut oil gives additional flavour to the curry. This is one of the must have dishes in Onasadya (Onam feast) of Kerala.This is a simple to make pulincurry. There are many variations to this recipe. I have also mentioned the variations at the end of this post. Tamarind paste - 1 tablespoon OR tamarind extract from key lime sized tamarind. Cut pumpkin into medium sized cubes. Need not peel the skin. In a kadai, roast the coconut in low heat until golden brown and grind alongwith cumin seeds and red chilli to a smooth paste. Cook pumpkin pieces in water alongwith salt, green chilli and turmeric powder. When half done, add tamarind extract ,hing and chilli powder and cook until raw smell diffuses. Now add the ground paste and cook for a few minutes in medium flame. Temper with the given ingredients. Serve with rice. NOTE: Roasted coconut gives the flavour. If health conscious, just add grated coconut. 1. Sauteed shallots are added. 2. Coriander seeds, methi seeds, tur dhal, urad dhal are roasted in oil and ground with coconut to a powder. This is called podi podicha pulinkari. These ingredients can also be ground to a paste. 3. Cooked tur dhal is added.